$30 ticket price is for presale only. Price at gate on day of event is $35. VIP section premium seating closest to starting line. Friday ticket only. Limited Quantities. Best Seats VIP -This is a VIP premium seating section closest to the starting line, only accessible to Best Seats VIP ticket holders. Limited Quantities. Online/Presale price is $39. Price at gate on day of event is $50 (if available). Be sure to also purchase a VIP ticket for your child so he/she has a spot. Tickets available for children below for $5. Best Seats VIP -This is a VIP premium seating section closest to the starting line, only accessible to Best Seats VIP ticket holders. Limited Quantities. Online/Presale price is $59. Price at gate on day of event is $70 (if available). Be sure to also purchase a VIP ticket for your child so he/she has a spot. Tickets available for children below for $5. This is a VIP starting line access ticket for Friday as well as a general admission ticket into the venue. No additional ticket needed. Limited Quantities. Get Me To The Line VIP - Starting Line Access. This is a exclusive section that gets you up close to the starting line where the Street Outlaws line up to race as well as meet for the Driver's meeting. This section gets the most fan interaction with the Street Outlaws cast. This ticket includes general admission into the venue. Limited Quantities. Children are not allowed at the Starting line. Online/Presale price is $59. Price at gate on day of event is $70 (if available). This is a VIP starting line access ticket for Saturday as well as a general admission ticket into the venue. No additional ticket needed. Limited Quantities. Get Me To The Line VIP - Starting Line Access. This is a exclusive section that gets you up close to the starting line where the Street Outlaws line up to race as well as meet for the Driver's meeting. This section gets the most fan interaction with the Street Outlaws cast. This ticket includes general admission into the venue. Limited Quantities. Children are not allowed at the Starting line. Online/Presale price is $99. Price at gate on day of event is $120 (if available). This is the ultimate ticket for the Street Outlaws Mega Fan. Best Seats VIP section seating plus Starting Line Access (the most fan interaction with the Street Outlaws Cast), along with Staging Lane Access (before first round of Street Outlaws CAST Only Daily Driver race), as well as one hour early access to the Street Outlaws CAST Pits AND FREE access to the Pavilion where you can get free snacks, drinks and a dedicated cash bar throughout the day. See details for further info. Details: This is for the Street Outlaws Mega fan. This ticket allows exclusive entry into the venue and the Street Outlaws cast pits one hour before all other ticket holders. This ticket also gives you access to the Best Seats seating section (this is the premium seating closest to the starting line) as well as access to the Starting Line (where the cars line up and race and where the Cast hangs out). Also, right before the first round of racing, you'll be called down and given access to the Street Outlaws cast staging lanes as they line up to race (The staging lanes are closed to the public) AND FREE access to the Pavilion where you can get free snacks, drinks and a dedicated cash bar throughout the day. Online/Presale price is $89. Price at gate on day of event is $110 (if available). Be sure to also purchase a VIP ticket for your child so he/she has a spot. Tickets available for children below for $5. Children are allowed in the Best Seats section and The Staging lanes but are not allowed at the Starting line. This is the ultimate ticket for the Street Outlaws Mega Fan. Best Seats VIP section seating plus Starting Line Access (the most fan interaction with the Street Outlaws Cast), along with Staging Lane Access (before first round of Invitational), as well as one hour early access to the Street Outlaws CAST Pits AND FREE access to the Pavilion where you can get free snacks, drinks and a dedicated cash bar throughout the day. See details for further info. Details: This is for the Street Outlaws Mega fan. This ticket allows exclusive entry into the venue and the Street Outlaws cast pits one hour before all other ticket holders. This ticket also gives you access to the Best Seats seating section (this is the premium seating closest to the starting line) as well as access to the Starting Line (where the cars line up and race and where the Cast hangs out). Also, right before the first round of racing, you'll be called down and given a access to the Street Outlaws cast staging lanes as they line up to race (The staging lanes are closed to the public) AND FREE access to the Pavilion where you can get free snacks, drinks and a dedicated cash bar throughout the day. Online/Presale price is $159. Price at gate on day of event is $180 (if available). Be sure to also purchase a VIP ticket for your child so he/she has a spot. Tickets available for children below for $5. Children are allowed in the Best Seats section and access to The Staging lanes but are not allowed at the Starting line. This is a Children's VIP ticket to ensure a spot in the Best Seats section for Friday. Purchase this ticket for each Child sitting with an adult who's purchasing an Adult Best Seats or Adult MEGA FAN - I WANT IT ALL ticket. To guarantee a seat please purchase this ticket at the same time the Adult tickets are purchased. Two Children's VIP tickets available for each Adult VIP ticket purchased. FYI - Children are allowed in the Best Seats section and The Staging lanes but are not allowed at the Starting line. This is a Children's VIP ticket to ensure a spot in the Best Seats section for Saturday. Purchase this ticket for each Child sitting with an adult who's purchasing an Adult Best Seats or Adult MEGA FAN - I WANT IT ALL ticket. To guarantee a seat please purchase this ticket at the same time the Adult tickets are purchased. Two Children's VIP tickets available for each Adult VIP ticket purchased. VIP Parking Pitside closest to the Street Outlaws Cast Pit and Trailer/RV Parking. For Friday. VIP Pitside parking spot for Friday. These Pitside parking spots are closest to the Street Outlaws cast Pits and their RV/Trailers. VIP Parking Pitside closest to the Street Outlaws Cast Pit and Trailer/RV Parking. For Saturday. VIP Pitside parking spot for Saturday. These Pitside parking spots are closest to the Street Outlaws cast Pits and their RV/Trailers. RV/Motorhome Parking for entire weekend. There are no hookups. Please make sure to purchase a Friday and Saturday type ticket here at the presales site for all who enter in an RV before arriving at the venue. 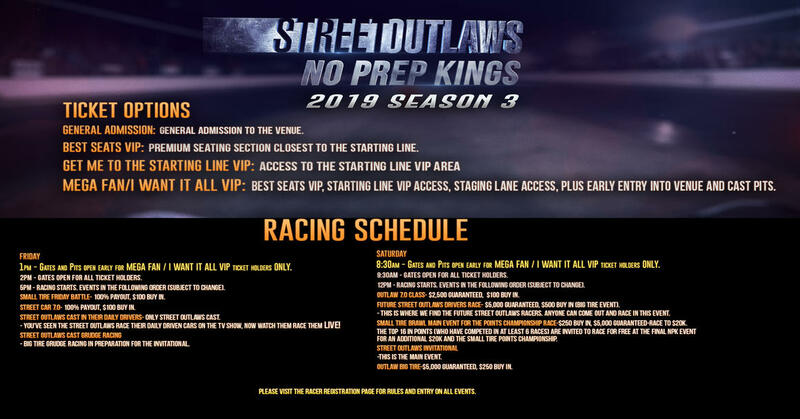 Street Outlaws No Prep Kings Event #4 at Firebird Raceway near Boise/Eagle, ID on July 12th and 13th, 2019. Street Outlaws No Prep Event #4 at Firebird Raceway in Boise/Eagle, ID on July 12th and 13th, 2019.